IT'S WEEK TWO IN THE FIELD, and I am headed in a new direction this semester. Whereas I spent most of the prior 15 weeks in CPS investigation with some intake on the side, this school term finds me in CPS Ongoing. Today I went on my first home visit with the case manager with whom I will be working. Last semester I worked with a female case manager, and this go-around I will be with a male. This will be a good experience for me, as I have worked primarily with women for the past couple of decades. In CPS Ongoing, we work with parent(s) who have allegations of abuse and/or neglect reported against them. The reports are either unsubstantiated, or substantiated but not severe enough to warrant immediate removal of their child(ren). If the parent(s) works a case plan in an acceptable manner, and if they are compliant with all other requirements of the agency, they are given a chance to retain custody of their child(ren). One of the supervisors explained to me that this can be a very dangerous situation for the children, and because we visit the homes for short periods of time, we must be extra vigilant to notice signs that the kids are in danger of abuse and/or neglect. This shall be a great learning experience for me. 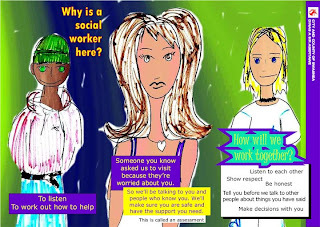 I will do my best to be a caring, watchful servant in this latest social work endeavor. ONe of the things that concern me is what happens to those children AFTER we leave? I have seen parents take out their fury for having been "outed" on the children.